Awhile back, I posted my thoughts about Dropbox commenting in a lengthy 2-part series. 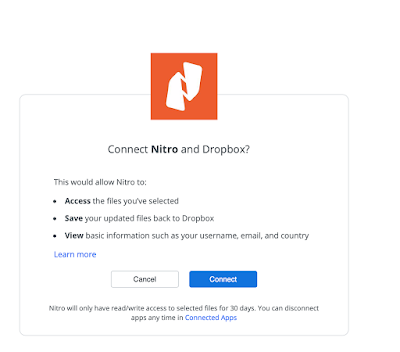 "I think that in addition to the big blue Share and Download buttons in the top right, Dropbox should have a button labeled 'Open in Acrobat." Well, I still don't use Dropbox commenting features, but it appears that Dropbox is raising their game! Here's what I came across today: a big "Open with" button. It appears that Dropbox is working with PDF editors to allow for online editing of PDFs stored in Dropbox. But guess who's missing from this list? That's right! Acrobat! 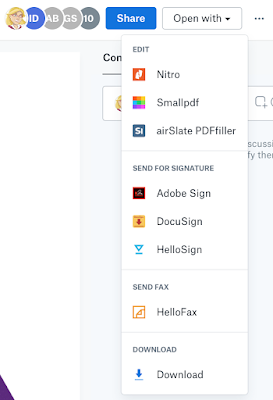 That's not surprising, seeing how Adobe Document Cloud is a direct competitor with Dropbox for online storage, editing, and commenting of PDF files. It's interesting to note that Adobe Sign is in the list, however. Stay tuned to see what develops next! 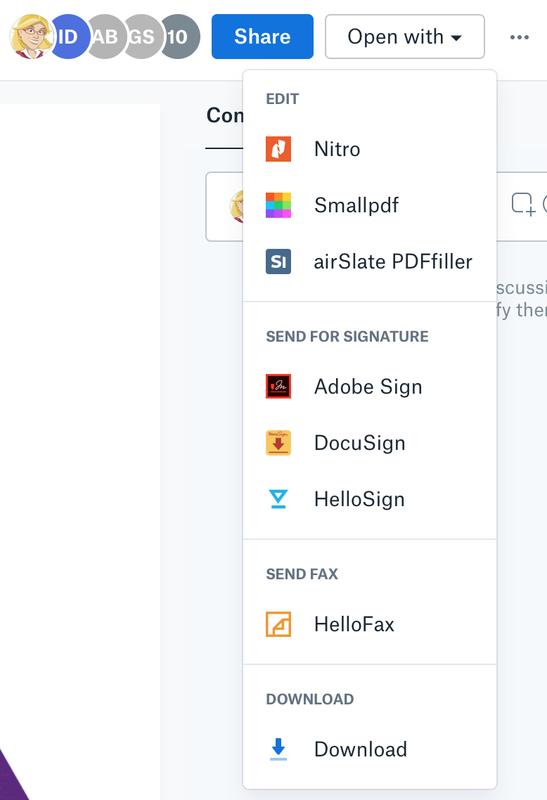 If Dropbox users didn't know about Acrobat's competitors, they sure will now, since they are in a beautiful dropdown list right inside what's probably the world's most popular file sharing service. Will Dropbox allow for their comments to be embedded? Will Adobe allow for their technology to be integrated into the Dropbox ecosystem? Who knows...?